Emilio Bueso (Castellón, 1975) is a systems engineer and writer. He has published numerous short stories and five novels, including Diástole (Salto de Página, 2011 – Celsius Novel Prize 2012), Cenital (Salto de Página, 2012 –Celsius Novel Prize 2013) and Esta noche arderá el cielo (Salto de Página, 2013). 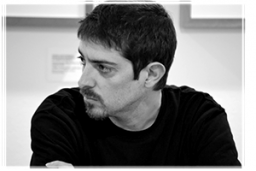 After the publication of the novel, Extraños eones (Valdemar, 2014) and a collection of horror stories entitled Y ahora intenta dormir (Valdemar, November 2015), his latest works are Transcrepuscular (Gigamesh, 2017) and Antisolar (Gigamesh, 2018) the first i second installment in a scifi trilogy.